Araucaria heterophylla is commonly known as the Norfolk Island Pine, as it is found on Norfolk Island of the coast of Australia. This species has a restricted range occurring on just one other Pacific island (Phillip Island) and consequently it is listed as Vulnerable on the IUCN Red List. Despite this the Norfolk Island Pine can be found across the globe where it is commonly propagated for use as a house plant, as a Christmas tree or as a coastal ornamental. It is grown as an ornamental due to its attractive evergreen foliage, conical appearance and fanning, whorled layers of branches. In cultivation the tree is shorter than the heights reached on its native islands where specimens exceeding 40 m have been found. Sadly, the Norfolk Island Pine is threatened by more than just its restricted range as its population is also fragmented across open water. It has also experienced severe historical losses such as the removal of 200 trees from Nepean Island prior to the 1900’s, leading to its extinction here. A. heterophylla was the dominant forest tree on Norfolk and Phillip islands but through the efforts of logging and introduced, invasive species this natural habitat of evergreen, subtropical forest has been decimated to 10% of its original cover. The introduction of rabbits and other herbivores have wiped-out understorey cover and are the suspected cause of species decline on Phillip Island. 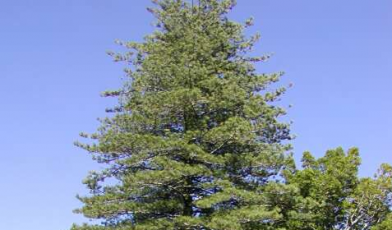 While on Norfolk Island competition from Olea europea, Psidium cattleianum and other introduced shrubby species have contributed to the decline in Norfolk Island Pine populations. More recently the species has become threatened by fungal dieback. 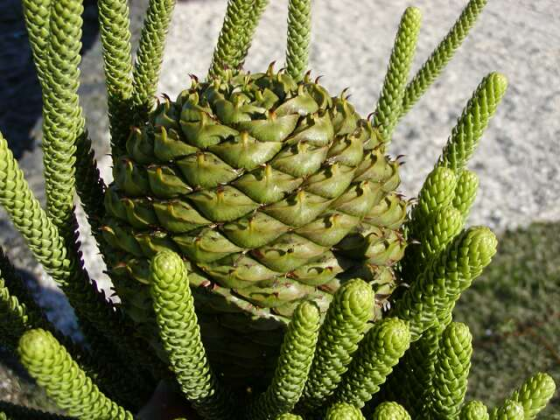 The Norfolk Island Pine population is currently sustained through conservation action. The species is protected in the Norfolk Island National Park, where the largest population exists on Mount Pitt. There is also a public and private effort to remove non-native species and to replant Norfolk Island Pines to reinstate a self-sustaining population, it is due to these continued efforts the species is not more severely threatened. These efforts are aimed to encourage the re-establishment of the once dominant Araucariaceae forests on Norfolk Island and improve populations of other declining flora and fauna such as the endangered Norfolk Island Green Parrot (Cyanoramphus cookii). Thomas, P. 2011. Araucaria heterophylla. The IUCN Red List of Threatened Species 2011: e.T30497A9548582. http://dx.doi.org/10.2305/IUCN.UK.2011-2.RLTS.T30497A9548582.en. The bristlecone pine may be the world’s oldest known living organism. One tree found in California’s White Mountains is 5,062 years old.